This coming week is the Care Quality Commission’s InvisibleConditions campaign and Monday is highlighting Lyme disease. 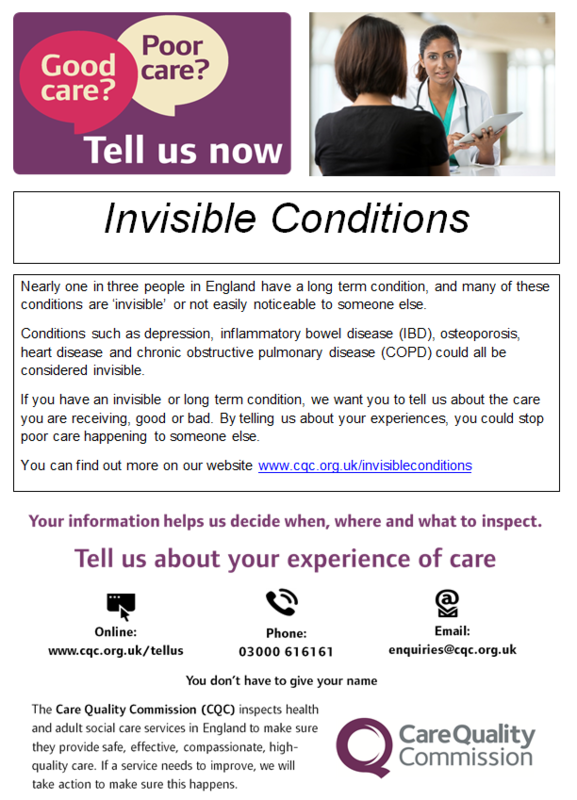 The Care Quality Commission needs people with invisible or long term conditions, like Lyme Disease, to tell them about the quality of care they have experienced, good or bad. Your experiences will help CQC inspectors decide when, where and what to inspect and might help bring home the reality of what happens to Lyme disease patients and thus improve care in the future. The CQC found in their State of Care Report 2014/15, that people with long-term conditions were less likely to report good experiences of using services. Although many services generally provide good care, this experience seems to be lacking for many Lyme patients who often report feeling unheard and that their concerns are not taken seriously. Use this link to speak out and make your voice heard, to try and highlight the urgent need to improve NHS services for Lyme disease patients. Some patients have had poor care and dismissal of their concerns from one hospital, but good, compassionate care from another. If this has been your experience, then please tell this story to reveal the contrast and to emphasise that if a tiny minority can provide good care, then everyone else could learn and follow. Lyme disease can be invisible to relatives and friends; we all look “normal”. Chronic Lyme disease is also invisible to many health professionals who “just don’t see it”. If you have tried to get through the brick wall in your search for responsive and effective care, please tell your story to the CQC.